Everyone knows one of the biggest burdens of parenthood is saving for a kid's college education. After all, a single year at a state university could cost $41,228 by 2030. But what about those 18 years leading up to the day Junior heads off to the dorms? Even if you opt for public school, education doesn't come cheap. Fortunately, there's no need to panic. As long as you're smart about budgeting and take advantage of tools like a cash-back card that earns back 1.5% of the money you spend, like Capital One's Quicksilver, you can rest assured your future valedictorian will be hitting the books harder than your wallet. According to the USDA, the typical family raising a child born in 2013 can expect to spend almost a quarter million dollars. Of that, 18 percent — or $44,400 — covers child care and education. With each new school year comes another round of back-to-school shopping. What most parents don't realize is how much schools expect them to cover. The Today Show reported that this year, the average K-12 parent spent $100 on school supplies per student — everything from notebooks and pencils to items like hand sanitizer. That's 12 percent higher than in 2013. Basic supplies are just the tip of the iceberg. According to the School Nutrition Association, the average school lunch costs $2.08, while the average sack lunch is about $3.45 to prepare. With 180 school days per year, you can expect to shell out $375 to $621 each year to keep your kid well-fed while attending class. School uniforms can be a godsend for parents. There's no arguing over what to wear every morning, fewer distractions at school, not to mention fewer trips to the mall for new outfits. At the same time, uniforms are another spending category you might need to budget for. And at about $249 per year, it's no small expense. Most students require access to a computer for typing up homework and performing research for projects and papers, but teachers are also increasingly taking elements of the classroom to the internet. A personal computer, laptop or tablet is more important to K-12 education than ever, and according to Laptop Magazine, the average PC laptop cost an average $484. Some of the biggest financial wildcards for students and their parents are extracurricular activities like drama, band, and sports. The costs of pursuing these hobbies range widely depending on the activity, the school, and the age of the student. A July 2014 survey by RetailMeNot found parents spend about $396 on extracurricular activities every school year. Higher education is a whole other ballgame. Not only are students venturing into the world of independence with a host of new financial responsibilities, the actual cost to attend school is pretty hefty. 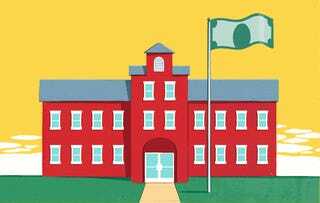 According to the College Board, average tuition and fees for the 2013-2014 school year were $30,094 for private colleges, $8,893 for in-state public schools, and $22,203 for out-of-state students attending public schools. Now you know what you have to buy — so how do you save money on all that spending? It's easier than you might think. Whether it's basic school supplies, uniforms, books, or gadgets, the internet offers a number of ways to save. A quick scan of coupon sites like RetailMeNot, Coupon Cabin, and Ebates can help you find discount codes for most online retailers. Amazon Prime members can save a ton on shipping, too. John Heath of Lexington Law also suggests using discount textbook sites to save money on books. "Check out chegg.com for a Netflix-like approach to textbook rentals. If you can't find the right book, browse discount sites like ecampus.com or alibris.com." It pays to shop at retailers that offer significant student discounts, like the Apple store, where students can receive $200 off a new Mac. AT&T is another company that offers students discounts on phones and plans. In fact, there are hundreds of places where you can get discounts on school-related purchases. See a list of retailers with student discounts here. One of the best money-saving strategies when shopping for school supplies is getting paid to do it. Using a cash-back rewards card like Quicksilver from Capital One means you earn 1.5% back on every purchase you make. That's putting money you're spending anyway back in your own pocket. Maybe you can afford that Ivy League school, after all.